Celebrate a promotion, graduation or a new job with an executive desk wedge! Executive name plates are perfect for showing just how much you appreciate someone. They also make an excellent award for any achievement. With a class of excellence above any other, these beautiful nameplates are sure to show how much you care. Whether you give one as a gift or buy one for yourself, the professional quality reflects the excellence you demand from yourself and your company. Each desk wedge can be customized and personalized with a name, a title or a favorite saying. Choose from several different styles and colors. Each desk wedge will have an engraved metal name plate attached with your requested details. Available in multiple wood finishes as well as metal face plate colors, these wooden wedges are fully customizable. 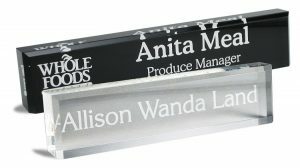 Your message, including text and logos, is laser engraved into a metal name plate that is adhered to the surface of a desk wedge of your choice creating a memorable and everlasting impression for anyone. Corporate gifting is another great use for these wedges. And corporate gifting can be one of the best ways to grow and maintain your business. Most companies agree that the fundamental reason for gifting is to acknowledge relationships and to improve personal connections. Customize each name plate with a person’s name, title or favorite saying. Or choose their company logo to go with their name for a unique look. 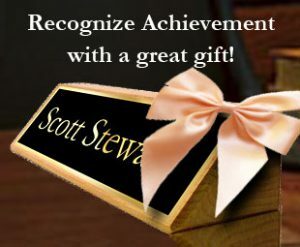 Highlight an achievement with an honorary title or statement that will mean something special to the recipient. What is the significance of a name plate? As a name plate is the easiest place to display someone’s name and title, a nameplate becomes extremely important. And, most people find their title necessary and important during their busy days. Executive desk wedges remind someone of their status and help others to see it as well. So, it’s a perfect gift for anyone to help them understand what they mean to you. No matter the reason for the gift, an executive desk wedge will show them how much you care. Create desk and wall name plates for yourself, your boss or your entire company. Add a personal touch to any workspace by displaying a name and a title. At home, use a name plate to decorate with loving expressions or quotes. 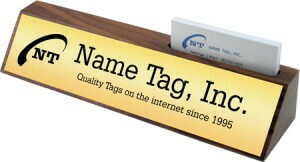 Display someone’s name and title on a desk, door or wall mounted nameplate. It’s just that simple! Providing instructions or directions to visitors in any store of office is a must! Customize nameplates with most any instructions to meet most any need. Whether it is just to point out a meeting room or a restroom, these directions are required in most settings. Corporate gifting is one of the best ways to grow and maintain your business. Most companies agree that the fundamental reason for gifting is to acknowledge relationships and improve personal connections. Customize each nameplate with a person’s name, title or favorite saying. 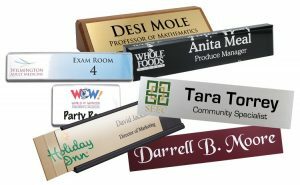 Whether it’s a restaurant or retail store, these nameplates are perfect to let your customers know what exactly they are getting. Just provide a clear label for your next buffet or end-cap, consumers are guaranteed to come back for more! Create a unique decorating style by displaying acrylic block with your favorite quotes and sayings. These blocks command attention, and due to how thick they are, they stand by themselves with no holder needed. Front engraving gives these blocks a solid look while engraving the back brings out the engraving by providing reflections and depth. Executive name plates are perfect for showing just how much you appreciate someone. They also make an excellent award for any achievement. With a class of excellence above any other, these beautiful nameplates are sure to show how much you care. 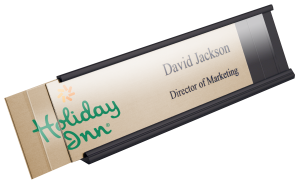 Adding a logo to a nameplate is an inexpensive way to maximize branding for both employee and company benefits. 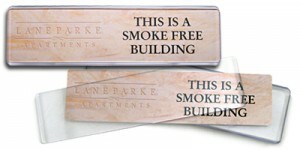 And they are such a great way to create consistent branding throughout any office or building. What an easy way to display a room number or title for all to see. With custom plates designed for your specific needs, these tools are very useful in a school setting. Other public spaces such as libraries, gyms or other recreational outlets often benefit from this remarkable tool. Coller Industries even uses these plates to help us stay organized! Customize with colors and names or numbers to help your book shelves or storage shelves keep and stay organized. Banks often use name plates as well! With messages such as Next Teller Please, Lane Closed, and other instructions, these engraved tools are perfect for a bank setting. 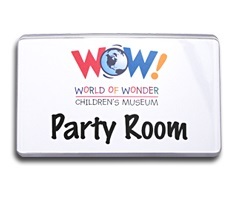 But no matter how you use them, name plates are a great tool for everyone!